I love baked spaghetti. It's such a comfort food. I've created a version that I love, and will share it here. It's not so much a recipe - I just go by feel, so you can tinker with it at will. Preheat oven to 375*. Heat olive oil in skillet. Add onions and garlic, sauté until tender. Add sausage (casings removed, if you buy that type). Meanwhile, start boiling spaghetti and cook according to instructions on box. Once sausage is partially browned, add green peppers and carrots. Continue to sauté until softened. Add mushrooms. Drain spaghetti and return to pot, toss with jar of spaghetti sauce. Layer half in 9 x 13 pan. Put half the veggie/sausage mixture on top. Sprinkle cheeses (about 1/2 cup of each). Layer again - spaghetti, veggies, cheeses. Cover with aluminum foil (try to tent it, so that it doesn't touch the cheese on top) and bake for 30 minutes. Sounds a little like fried spaghetti -- yum! Oh yum I need some comfort food ! yum!! i love spaghetti-now i am hungry! i am now bookmarking that great recipe. YUM! This sounds like it could easily become a favorite at our house! I have always wondered about baking pasta after boiling it. Thought it would be mushy. I need to try this. It definitely is comfort food. Warm, filling, and yummy. Delicious! Baked spaghetti is something that I've actually cooked before. :-) I like it better than regular spaghetti. This recipe sounds good. I want to eat meals at your house! All the recipes you post look and sound so yummy. This one has provided inspiration for tonight's dinner, thank you! 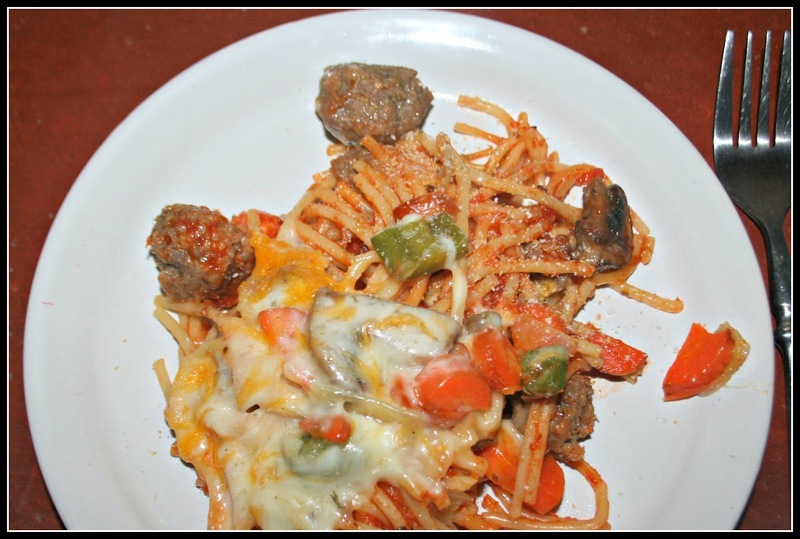 I've never had baked spaghetti but we all love pasta so this is definitely a must try! Your recipe looks good, Lisa! This really looks delicious! We will need to try it. It sounded good, so I am making it for dinner tonight! I've never heard of baked spaghetti before, your recipe looks easy and the photo delicious, a must try :-). That's one of my favorite foods. Mine is not so full of good things, I just use tomato sauce and dehydrated onions, with some grated cheese. But it certainly is comfort food. I did tinker with it. Used fresh portobellas, and ditched the carrots. Sauce was Newmans Own Sockarooni. Everyone seemed to like the recipe, though only two of us enjoyed the mushrooms. We both like spaghetti and would like this recipe! I have a "Confetti Spaghetti" recipe that's really good too - and easy. I'm all about easy. I've never made baked spaghetti....but this looks delicious and comforting. Thanks for sharing! I love that your recipes are always so simple and things my family would eat!